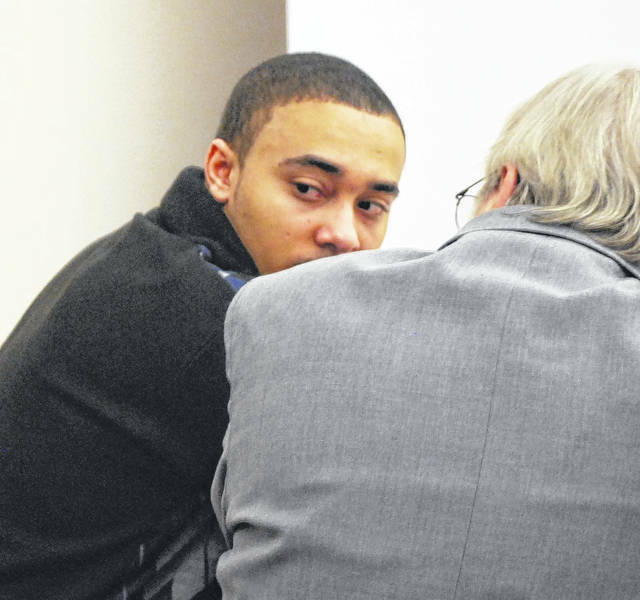 J Swygart | The Lima News Cory Jackson was led from an Allen County courtroom late Wednesday afternoon after being found guilty of murder and aggravated robbery in the 2016 shooting death of Amari Gooding. 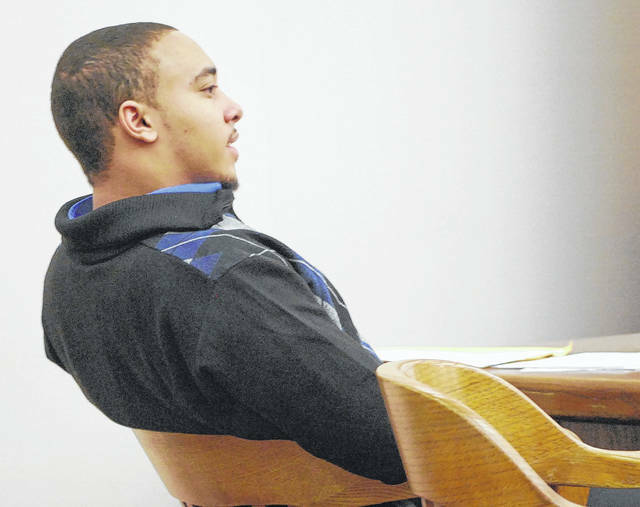 Cory Jackson showed no emotion as the verdicts were read aloud in court Wednesday. Marquise Turner, an inmate at the Allen County jail, took the witness stand Wednesday in the murder trial of Cory Jackson. 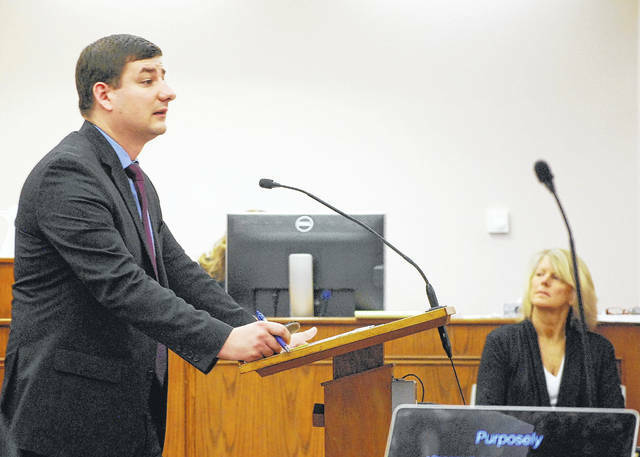 Assistant Prosecuting Attorney Kyle Thines delivered a portion of closing arguments for the state on Wednesday. 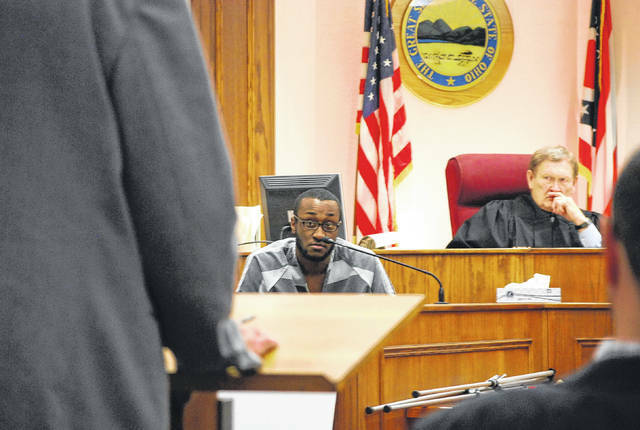 LIMA — A jury of eight women and four men deliberated for five hours Wednesday before returning a guilty verdict against Cory L. Jackson, the 20-year-old Lima man charged with murder in the death of Lima resident Amari Gooding. Jackson was accused of shooting the 20-year-old Gooding to death in the parking lot outside the Main Street Irish Pub in downtown Lima in the early-morning hours of Oct. 8, 2016. He was indicted in June 2017 by a grand jury on charges of murder with firearm specifications, an unclassified felony, and aggravated robbery with firearm specifications, a felony of the first degree. Jurors on Wednesday found him guilty on both counts. Jackson, who showed no emotion when the verdicts were announced, faces a prison term of 18 years to life when he is sentenced at a later date. The state built its case primarily around the testimony of Trey Ackles, who told jurors Tuesday during the trial’s opening day that Jackson robbed him at gunpoint in the parking lot of the bar on the night in question. When Gooding came to his aid, Ackles testified, Jackson pointed a gun at Gooding’s chest and pulled the trigger. Testimony offered Wednesday morning, however, offered contrasting accounts of the events that took place at the pub that evening. Two inmates from the Allen County Jail, local men who were at the bar on the night of the shooting, took the stand on Wednesday. Marvin Bridges, who described himself as a friend of Cory Jackson “since fifth grade,” said he arrived at the pub with Jackson on the night of the incident. He recalled that some 15 minutes later Ackles and Jackson went outside to talk. Bridges said he went outside later smoked a joint with Jackson, at which time he “heard a confrontation” coming from a group of eight or nine people in the parking lot. Bridges said Ackles, Gooding, Blake Patterson and others were in a group when Ackles pointed his finger at Jackson in an threatening manner. “Trey walked toward Cory and Cory dropped him,” Bridges testified, clarifying that Jackson struck Ackles with his fist. Ackles had testified earlier that Jackson struck him with a gun, knocking out one of Ackles’ teeth. “Did Cory have a gun that night?” asked Defense Attorney Bill Kluge. Bridges said Jackson was not armed that that he (Bridges) did not see anyone else with a gun that evening. Shortly after Jackson struck Ackles, Bridges testified, he “heard a pop,” which he said was a gunshot. Detective Todd Jennings of the Lima Police Department testified Wednesday morning that Jackson became a suspect in the shooting when “his name was given to me” as he attempted to interview Ackles at the hospital on the night Gooding died. Jennings said police were unable to locate Jackson, once called one of Lima’s most wanted men, until he was arrested in Detroit in April 2017, even though he had given police a false name at the time of his arrest. 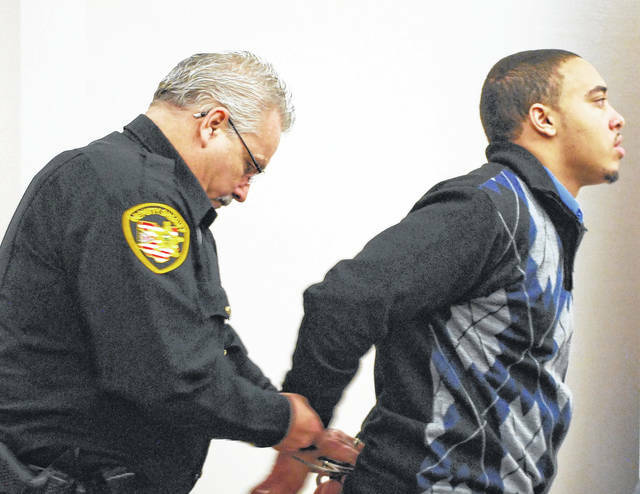 https://www.limaohio.com/wp-content/uploads/sites/54/2018/02/web1_Cory-trial-day-2-3-cuffed.jpgJ Swygart | The Lima News Cory Jackson was led from an Allen County courtroom late Wednesday afternoon after being found guilty of murder and aggravated robbery in the 2016 shooting death of Amari Gooding. https://www.limaohio.com/wp-content/uploads/sites/54/2018/02/web1_Cory-trial-day-2-2.jpgCory Jackson showed no emotion as the verdicts were read aloud in court Wednesday. https://www.limaohio.com/wp-content/uploads/sites/54/2018/02/web1_Cory-trial-day-2-Marquise.jpgMarquise Turner, an inmate at the Allen County jail, took the witness stand Wednesday in the murder trial of Cory Jackson. https://www.limaohio.com/wp-content/uploads/sites/54/2018/02/web1_Jackson-trial-prosecutor-Kyle.jpgAssistant Prosecuting Attorney Kyle Thines delivered a portion of closing arguments for the state on Wednesday.